Jamie Woodward talks about what makes Manchester’s Geography students’ learning experience distinctive. This week we begin a series of articles on teaching and learning. We will showcase the impact of teaching on the student experience, share examples of great teaching practice, update you on development opportunities, and highlight student success. 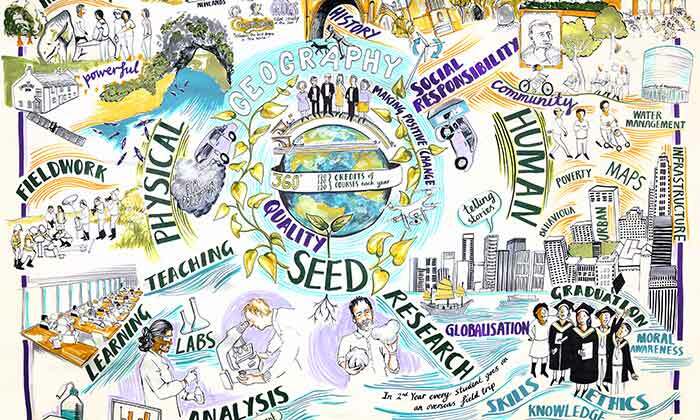 In our first story, we hear from Head of Geography, Professor Jamie Woodward who, along with colleagues throughout his department, puts the value of a distinctive student learning experience at the heart of their work. “In Geography we have a long-established culture of valuing and rewarding excellent teaching”, he said. “I think this comes from accepting that world-leading research and teaching excellence are absolutely not competing aims. In my own experience, the very best teachers are often the most successful researchers. The Department has been widely recognised in the media this year thanks to several high impact stories, including research on energy poverty, wildfires, and microplastics in rivers – which made headlines around the world. “It’s important to be able to get these stories out, with the support of our colleagues in the University Media team, so that prospective students (and their parents) can see what it means to study Geography and what impact our research can have”, said Jamie. “Over the past two years we’ve invested heavily in recruiting people who already are, or have the potential to be, excellent teachers and world-leading researchers. All our Professors contribute to teaching our undergraduate students; we think it’s vital that students can see that, whatever stage we’re at in our career, we value their learning experience as much as we value our research. If you have a teaching and learning story you’d like to share with staff across the Faculty, please email humsnews@manchester.ac.uk.